Terrorists | Which way is up? My baby is becoming a two year old. Or a sociopath. I can’t figure out which. Example from tonight at dinner (which was pizza, by the way… Pizza. The world’s least objectionable food). Me: What sweetie? Do you want me to cut it? Walter: (Lifts piece to mouth and I think I’ve finally got it… Takes it away again and-) NOOOOOOOO!!! Big! Big! Me: (After several wrong guesses) You mean you don’t want it cut? You want to eat a big piece like this? Me: Ok (eye-roll), here you go. Walter: NOOOOOOOOOOO!!!!! It’s broken! Broken! NOOOOOOoooo!!! Me: (After several wrong guesses) You mean there’s a string (of cheese)? Walter: (Looks at it for a second) NOOOOOOOOOOoooo!!!! Cut it! Cut it! 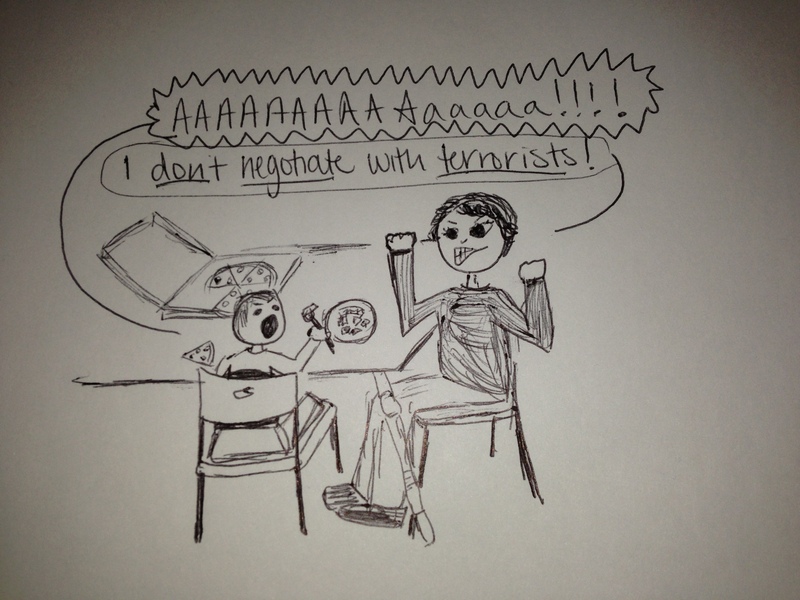 I don’t negotiate with terrorists.